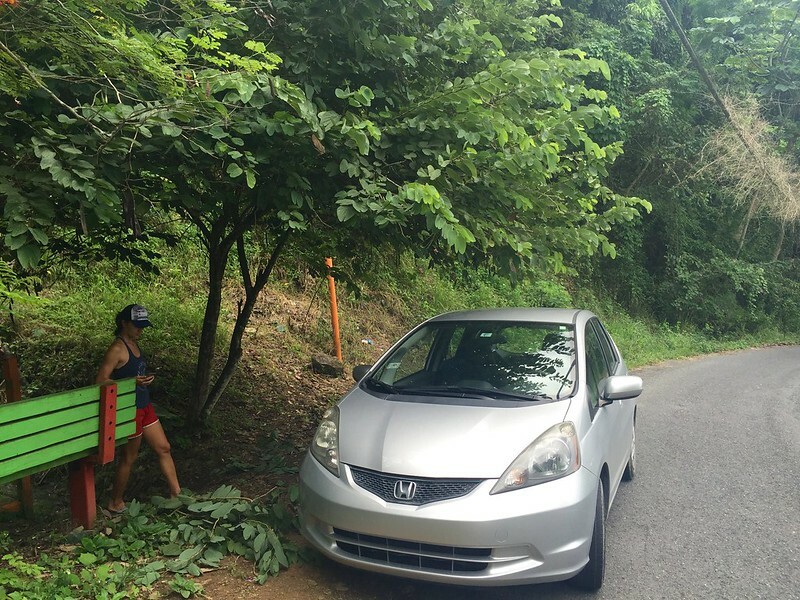 A couple of friends from Spanish class and I have been trying to do an adventure once a week or so as a way to explore more of our island. 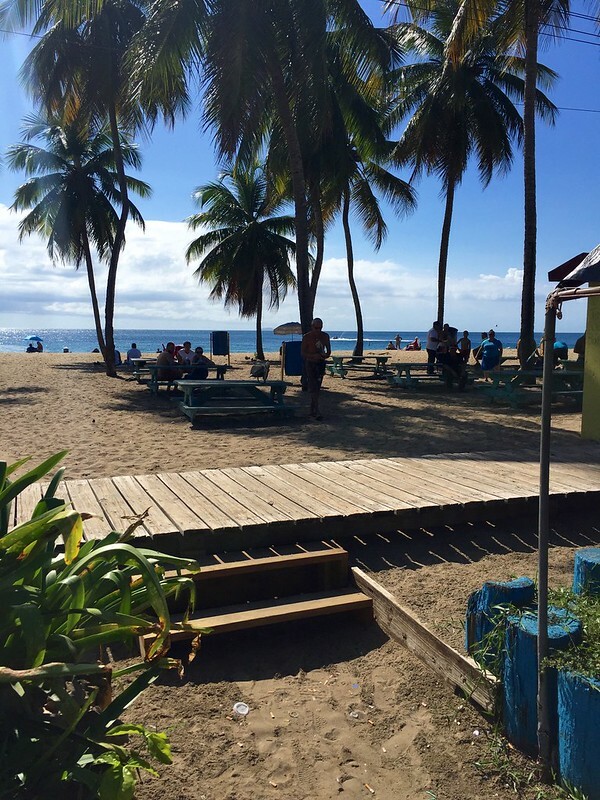 Last week we drove up to Aguadilla and hung out at Crash Boat beach for the day snorkeling and swimming. It's a great beach and I hear it's packed on the weekend. There are tons of fish to check out at the end of the pier and a great show by a local gentleman that has trained about 7 pelicans who answer him by name. It was such a fun day I forgot to take many pictures! Here’s one with pelican man and his pelican Debbie - it's not a great shot but shows how pretty the beach is. This week we decided to see what we could find adventure-wise in town. 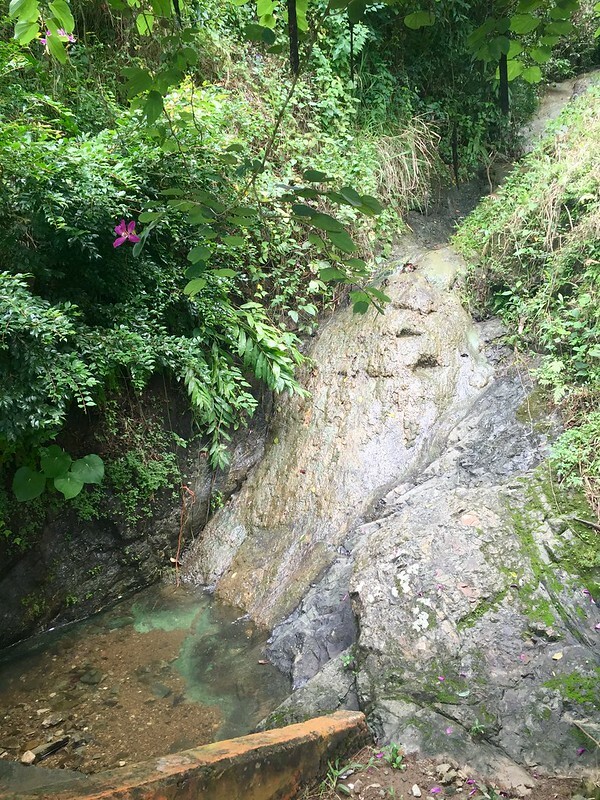 We had heard there was a local waterfall called Ultimo Brinco but none of us had been to it. I found directions to it online and it's literally right in town. It’s in the Calvache neighborhood off a small dirt road about 2 kilometers in on 411. On a wet and muddy day I would park on the road and walk down but today was pretty dry so we drove in and it just appeared out of nowhere! 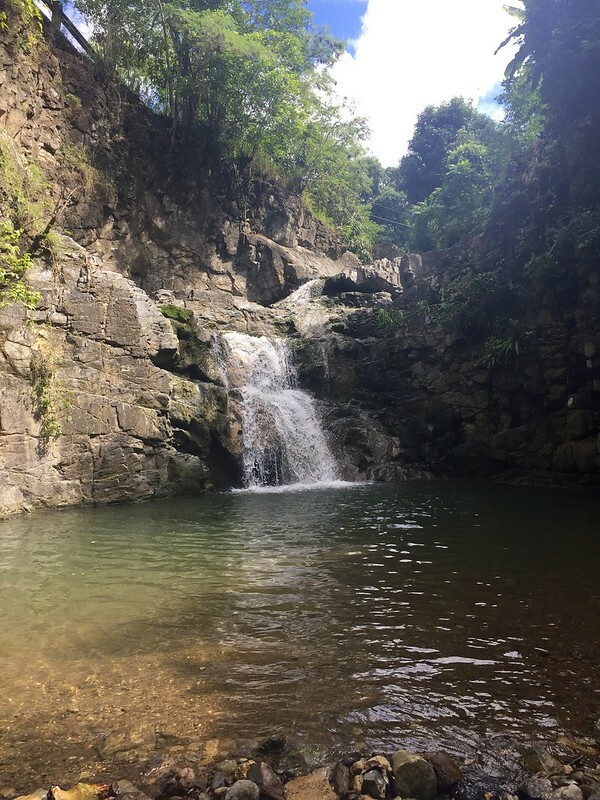 It’s definitely not a large waterfall by comparison to the ones in El Yunque or found throughout the rest of the island but there is a small pool and it feels like you’re in the middle of the jungle and not a neighborhood in town. My friend who helps with Surfrider’s water quality testing here mentioned the bacteria levels in the quebrada (creek) that feeds the falls aren’t so great so we didn’t fully submerge ourselves, as it's not something we should probably be drinking. 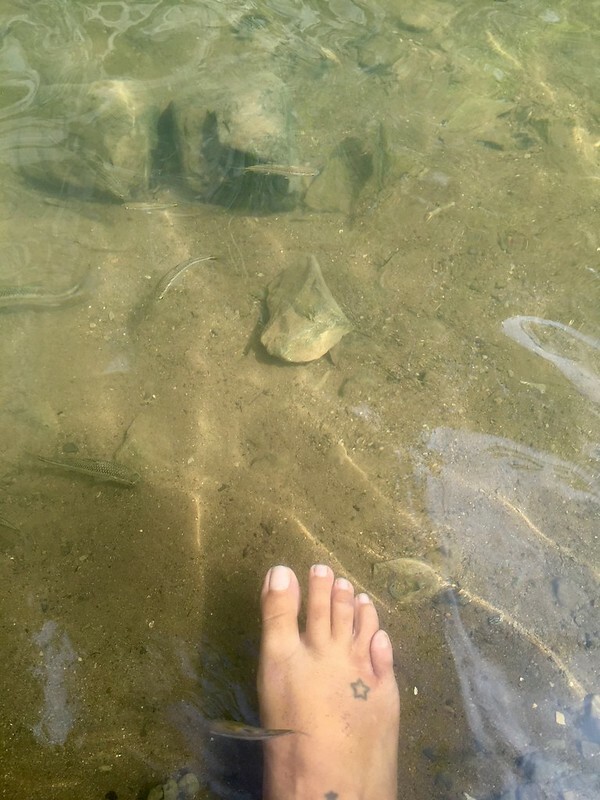 Instead we found a log to hangout on and let the little fish nibble our toes. We also took a drive up the 412 near our jungle property to stop by another little waterfall Alejandro and I saw last week. This little fall is small with no pool to swim, but the locals must really appreciate it as it's literally on the side of the main road 412 and someone has built a bench on the road facing the waterfall. It's a funny juxtaposition because across the street is a great ocean view across the valley but you see none of that if you are sitting on the bench. Just the falls and the beauty that surrounds them. **P.S. - Some more random produce this week! These came from my friend’s yard! 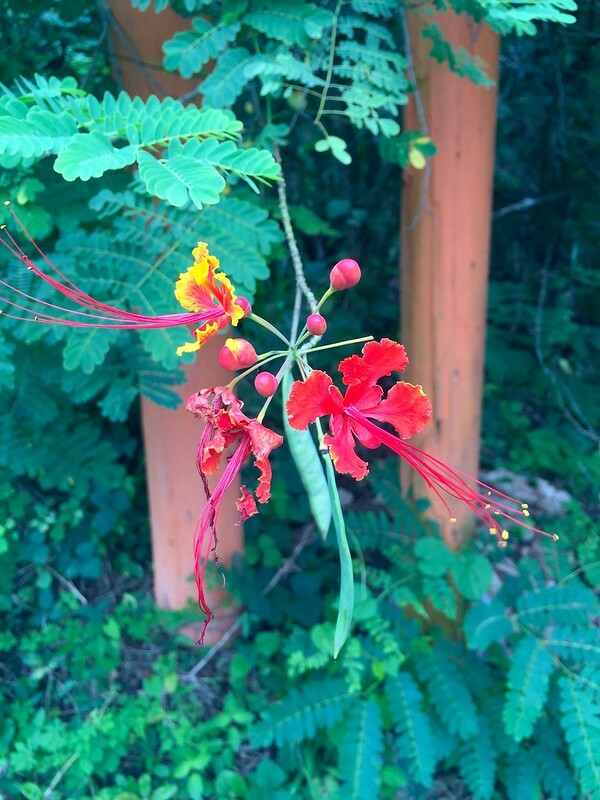 Top of the photo are leaves from their Cinnamon Tree! Just tear up 3-4 leaves and boil them for about 5 mins and you have a really tasty beverage! 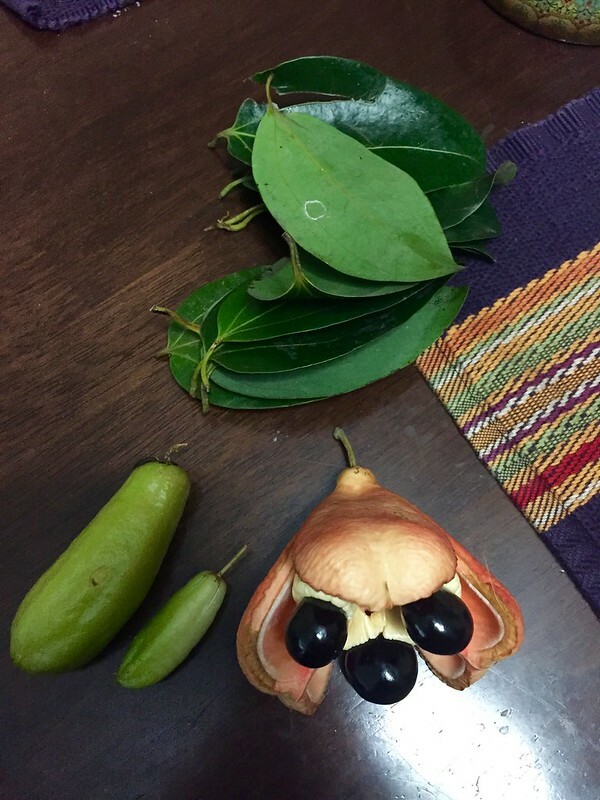 Bottom left is called a Bilimbi fruit - very sour with a slight taste like a star fruit - they are related to the star fruit and taste like they would be excellent if made like a lemonade. Bottom right is called Ackee and its a Jamaican fruit used for their national dish called Ackee and Saltfish. You can only eat the white part of the fruit below the seeds and you have to wait until they open on their own as the gasses inside the fruit are toxic as are the black seeds. They can lead to Jamaican Vomiting Sickness, so beware! It’s like the blowfish of the tropical fruits!